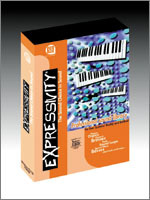 Expressivity is the first professional sound library designed specifically for your Seer Systems software synthesizer. Expert sound design gives you the warmest, richest digital sounds available in the Seer Systems native format, and lets you discover the true power and expressive potential of your software synth. You'll reach for Expressivity every time you're looking for just the right pianos, basses, classic synths, sound loops, effects and more, to add the flair of European sound design to your work. If you are searching for the perfect inspiration for your next hit, reach for Expressivity: the Sound Choice in Sound. Expressivity is for PC only and is compatible with Seer Systems' SurReal and Reality only. Please download the demo file. It offers a sample of some of the almost 400 sounds included in Expressivity's library.